Welcome to Christ the Redeemer’s final Stewardship Sunday! You are also welcome after Mass to our parish’s last-ever Stewardship Fair. Don’t be alarmed—we haven’t given up on stewardship. Far from it—I just returned from the annual meeting of the International Catholic Stewardship Council and I’m as keen on stewardship as I ever was. 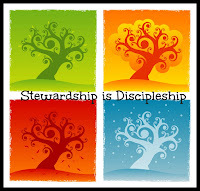 But the more I listened to the committed and talented speakers at the stewardship conference the more convinced I became that stewardship is really just another name for discipleship. As our parish intensifies its commitment to forming intentional disciples I think we should remind ourselves that the only goal of our stewardship of time, talent, and treasure is the dedicated following of Jesus Christ. And so, next year, you can look forward to the first annual Discipleship Fair! The day our conference ended another took over the hotel. It was for young computer wizards and part of it was what they call a “jobs fair”—a bunch of companies sponsoring booths offering employment opportunities. Our Stewardship Fair is a lot like that. It’s not advertising the great things we are doing in this parish—it’s inviting you to great things. Today’s Gospel shows how God puts each of us to work at different stages in our lives. One of the most committed volunteers in this parish is almost ninety; another one of the most active and generous parishioners is more than sixty-five years younger. The amazing generosity of the Lord of the vineyard is something to celebrate—but we mustn’t forget that all the labourers did some work. There’s no parable about God’s generosity to those who do nothing at all. I need to keep this homily short, but I do want to offer a prayer that I heard at the conference in Atlanta. It’s printed also in the bulletin, but one of the things I learned at the conference was that only half the people take a bulletin and only half of those actually read it! My parish is composed of people like me. I help make it what it is. It will be friendly, if I am. It will be holy, if I am. Its pews will be filled, if I help fill them. It will do great work, if I work. It will be prayerful, if I pray. It will make generous gifts to many causes, if I am a generous giver. It will bring others into worship, if I invite and bring them in. It will be a place of loyalty and love, of fearlessness and faith, of compassion, charity, and mercy, if I, who make it what it is, am filled with these same things. Therefore, with the help of God, I will dedicate myself to the task of being all the things that I want my parish to be. Amen.